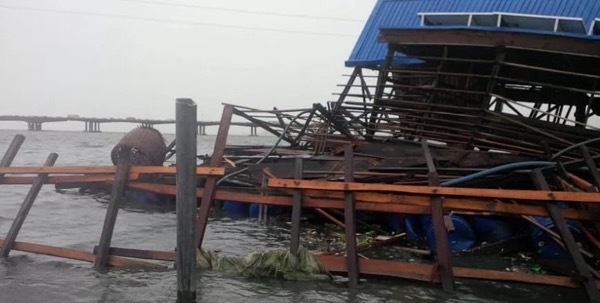 A controversial but much celebrated, award winning three-story floating school built on the Lagos Lagoon in 2013 has collapsed following torrential rain. 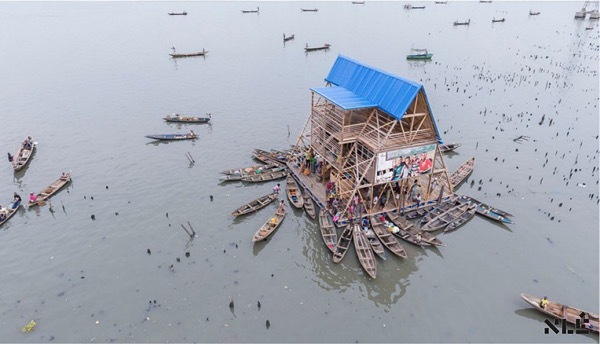 Constructed as a prototype to show how floating buildings could improve the lives of the impoverished Makoko community, it was designed by Kunlé Adeyemi, a Nigerian architect, as a school. Called the Makoko Floating School, it was perceived by Adeyemi and his team at NLÉ as an extension of Whayinna (which means love) Nursery and Primary School, which is built on reclaimed land that suffers from recurrent flooding. Furthermore, it is the only school that serves the historic Makoko coastal community on the fringes of Lagos, Nigeria’s largest city, which is also the largest city in Africa. But from the start, the Nigerian authorities refused permission for the structure to be erected, and has always considered it illegal, stating there were serious structural issues relating to safety. In spite of the deemed illegality of the structure he had designed, Adeyemi went ahead and launched the project in 2010, with support from the United Nations Development Program’s Federal Ministry of Environment, the Heinrich Böll Foundation (a global Green political movement), and Tafeta & Partners (a private UK-based art dealership). The official Makoko Waterfront Community and a number of collaborators were also involved. The floating structure, which was made from wood, locally grown bamboo and 250 plastic drums, was not in use at the time of the storm, and nobody was injured as a result of the collapse. In a press statement issued after the collapse, Adeyemi’s company NLÉ claimed the structure had been decommissioned “after three years of intensive use” and was to be upgraded before being made available as a school again. However, days after the collapse, Whayinna headmaster, Noah Shemede stated he had only used the floating school from October 2015, and had stopped using it in March this year because he didn’t believe it was sufficiently strong, but rather was potentially unsafe. He also contradicted reports that the school was built to accommodate 100 pupils and teachers, and said it was big enough for less than 60 children. The fact is that the prototype’s load-bearing structure fell apart, and with it the hopes of the community. Berlanda met Adeyemi in May this year at the Venice Biennale where the Nigerian architects second version of the Makoko Floating School (MFSII – see more below) was on display. Berlanda said he knew there was a “minor risk of drift” if the structure wasn’t properly anchored in heavy storms, and that the company had tried to minimize this risk. He maintained that Shemede decided to stop using the facility when a solution involving four anchors and mooring posts at the corners of the structure failed early this year, causing the floating school to drift. After the school was “abandoned”, some of its fixtures deteriorated rapidly, he said. Additionally, the classroom and toilet required “serious maintenance and repairs” before the school could be used again. One of the most pressing problems facing Nigeria is the frequent collapse of buildings – and not just buildings in the water slum of Makoko. A Canadian study published in 2010, Tackling Causes of Frequent Building Collapse in Nigeria found that the major challenge was that people couldn’t agree on which professional to blame as the major cause of building collapse. Building experts blamed the use of low quality building materials, incompetent artisans and inadequate supervision of workmen on site. Members of the public blamed non-compliance of specifications and standards as well as the use of substandard building materials and incompetent contractors. The number of lethal building collapses in Nigeria in recent years is too many to mention, and they aren’t limited to Lagos. One that many people will remember was the collapse in 2014 of the guesthouse at the Synagogue Church of All Nations that resulted in the death of 116 people, most of whom were South Africans. Regarded as the worst building collapse in the country, it was found by coroners at the inquest hearing to have been caused by structural failures. They also found that the building did not have the required planning permissions. This ruling resulted in a criminal negligence and involuntary manslaughter charge against the owner of the building, Nigerian preacher T B Joshua that is still ongoing. This is just one example of a tragic collapse where Nigerians have claimed the country’s legal system is simply not sufficiently strong to “hold a rich and powerful man accountable.” Joshua, who has been dubbed a “man of God” and “the Prophet” by his followers, claimed a mysterious aircraft caused the building to collapse. He subsequently refused to give evidence at the inquest or give evidence in court at his trial. In its quest to stop the “unwholesome trend of illegal development and needless loss of lives and properties,” the government would continue to take action until every single building in Lagos State was “fit for human habitation”. At the end of the day, the government had zero tolerance when it came to building collapse, he said. The commissioner also stated that compulsory testing of the integrity of building and construction materials would take place through the Lagos State materials testing laboratory. Makoko itself is a water slum where tens of thousands of people live in less than mediocre houses built on stilts in what is sometimes called “the forgotten Venice of Nigeria.” For more than a century it has existed thanks to Nigeria’s sawing and fishing industries, providing most of the city’s timber, and more than a third of its fish supply. a highly dense and urbanized area, yet it has no roads, no land, and no modern infrastructure. When they refused to move, the BBC reported that “shacks built on stilts” were knocked down by authorities armed with machetes. And then there was the Makoko Floating School that offered new hope. 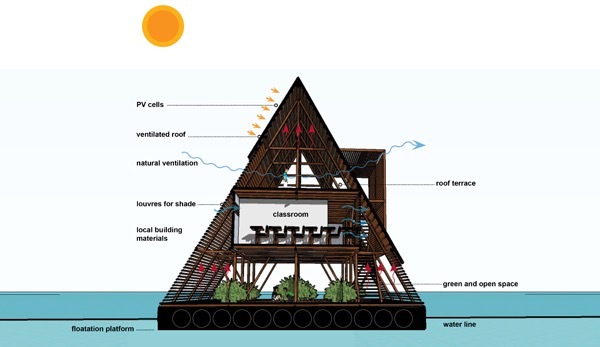 The main aim of the floating school has been to generate an ecological and sustainable alternative building system, as well as what was termed an “urban water culture” for the large, poverty-stricken population of this African coastal region. 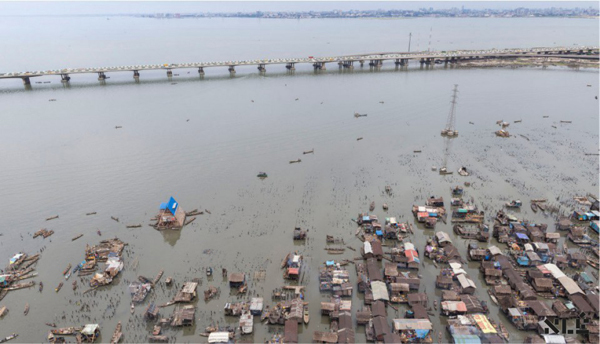 Due to the impact of climate change; rising sea levels, increased rainfall and flooding are becoming day-to-day reality, while modern infrastructure seems unavailable when it comes to informal settlements, such as Makoko, in Lagos. Certainly design-wise its success has been all embracing. In 2014 Adeyemi and his architectural, design and “urbanism” practice, NLÉ was shortlisted for the Design Museum in London’s Designs of the Year awards. Last year (2015) it was one of seven finalists in the International Award for Public Art (IAPA), a collaborative event hosted by the University of Auckland’s Elam School of Fine Arts and a similar school at Shandong University in China. Earlier this year, the floating school was selected as one of 19 projects (out of 348 on the long list) shortlisted for the Aga Khan Award for Architecture, that recognizes design excellence of architectural and infrastructure projects. The award, founded by the Swiss born spiritual leader (Imam) His Highness the Aga Khan, also acknowledges those projects that address the aspirations and needs of societies where Muslims have significant presence. A powerful demonstration, be it in Lagos or in Venice, that architecture, at once iconic and pragmatic, can amplify the importance of education. Both floating structures span 220 square meters, are three storeys high, and form a type of A-frame, with the building increasing in scale from its apex downwards. There is a platform at the base that is attached to empty barrels that enable flotation, and a middle section that was originally designed for a classroom. There is a roof terrace above the enclosed room that could also be used by teachers, and “green and open space,” below the room for playground use. A water catchment system and solar power generated by photovoltaic cells on the roof, as well as effective natural ventilation make it “green” and sustainable. He is hopeful that there will be an opportunity to build Adeyemi’s prototype again – in a “new, improved iteration.” Alternatively there may be a way to explore other options that may be “less seductive” but might provide a “better future” for Makoko. Adeyemi himself has not yet commented on the collapse, but has said that a comprehensive, consolidated report will be issued. We want to focus on a more basic, grass roots approach than the floating school and enable the community to do what they’ve already taken ownership over rather than building a second ‘fancy’ structure. In just a few days the Makoko School Rejuvenation Fund has raised $6,900.